An atrial with a noncompensatory pause. The pacemaker cells in the sinus node are not the only cells in the heart that can depolarize spontaneously. Actually all cardiomyoctyes have this capacity. The only reason why the sinus node 'rules' is that it is the fastest pacemaker of the heart. 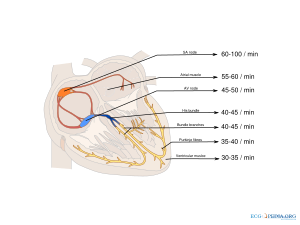 All healthy cardiomyocytes from the sinus node to the ventricles can function as ectopic pacemakers. Ectopic pacemaker activity can originate from the atria (60-80 bpm), AV-node (40-60 bpm) and the ventricles (20-40 bpm). So, as the sinus rate drops (e.g. during atrial infarction), other cells can take over. The configuration of ectopic complexes, or extrasystoles, as seen on the ECG, reveals its origin, whether they are atrial, nodal or ventrical. A ladder diagram showing a non-compensatory pause following an atrial premature beat that resets the sinus node and fully compensatory pause following a ventricular premature beat that does not reach the sinus node. The duration of the interval following a premature complex can help in the differentiation of a atrial or ventricular premature complex. If a sinus complex is followed by an atrial premature complex, the electrical activity of the atrial premature complex can enter the sinus node and reset its timing. If the sinus rate were, for example, 60/min, the reset pacemaker cells will restart firing after 1 full second had passed. The time from the extra complex to the next QRS complex in this example is thus 1 second. The sequence "normal sinus complex" - "atrial premature complex" - "normal sinus complex" will therefore be shorter than the 3 seconds it would have taken if the premature complex had not occurred. This is called a non (fully) compensatory pause. Sometimes the electrical activity of the atrial premature complex cannot enter the sinus node due to refractoriness of the sinus node (if the interval between previous sinus complex and atrial premature complex is short) or due to electrical block to enter the sinus node (as in sinus nodal disease). The electrical activity of a ventricular premature complex is usually not conducted through the AV node towards the atria. The sinus node will not be reset. If the next sinus complex finds the AV nodal tissue still refractory (and thus not conducting,) there will be a pause until the next sinus complex follows. The interval between the premature ventricular complex and the next sinus complex will be longer (longer than 1 second in the above sample of a heart rate of 60/min). This is called a fully compensatory pause. With the use of a caliper, the preceding sinus rate can be tracked beyond the ventricular premature complex. This is a telltale sign of a ventricular premature complex without retrograde conduction. This rhythm strip shows clear parasystole. Here the origin of the ectopic beats is somewhat distal to the HIS bundle. Parasystole is the phenomenon that results from two competing pacemakers in the heart. Usually a supraventricular and nodal/ventricular pacemaker compete. 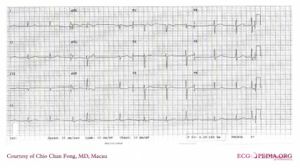 For example, sinus rhythm might be interfered with by ventricular ectopic beats. 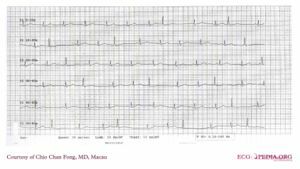 The basic rhythm in this example would be sinus rhythm with a rate of 60/min. Ectopic ventricular complexes can be seen interfering with this rate and rhythm. Parasystole is diagnosed when the ectopic complexes have a constant RR interval, e.g. 1500ms, resulting in a rate of 20 ventricular ectopic complexes per minute. Fusion complexes are often present as the two rhythms are dissociated. This page was last edited on 26 September 2011, at 09:37.